Accurate outline; crisply moulded plastic parts; nicely printed decal sheet with options for three different countries and three different theatre of operations, with minimal carrier film and perfect register. Limited release kit so will need some test fitting to ensure a good fit. 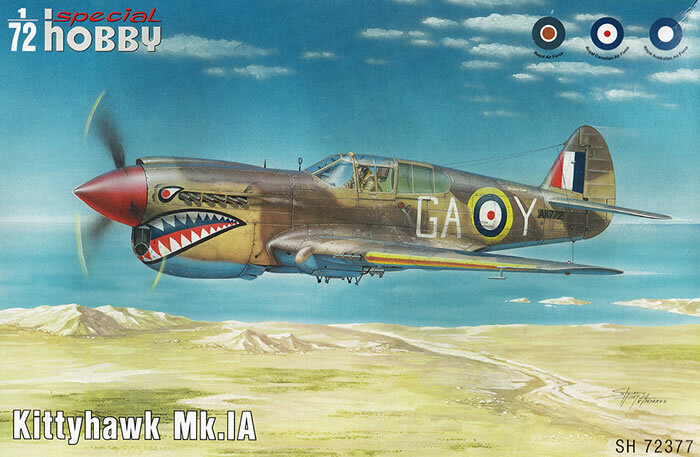 Special Hobby has reissued the range of Kittyhawks with this Mk.1A being the first of a series to receive new parts to upgrade the kit.. It appears to be accurate and easy to build kit of a well-known WWII subject. The P-40D/E Warhawk were the first versions of the famous fighter aircraft to be equipped with a new Allison F engine. The D and E versions differed only very slightly in the armament, the D carried just four machine guns in the wing while the E had six of them. Besides the USAAF, the second biggest purchaser of the type was the British RAF which desperately needed any suitable type of a fighter aircraft. 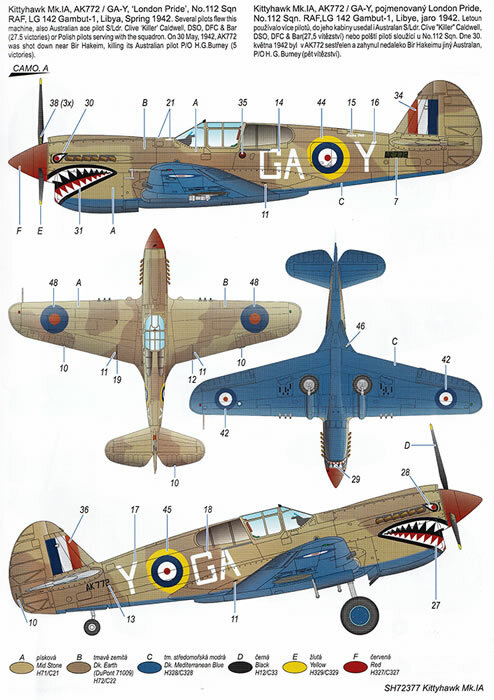 Because of rather unpleasant high altitude characteristics of the Allison engines which lacked the superchargers, it was not possible for the RAF to deploy the type in the skies of Europe, but put them in service over Africa instead and the P-40D/E became to be known as the Kittyhawk Mk.I and Mk.IA respectively. 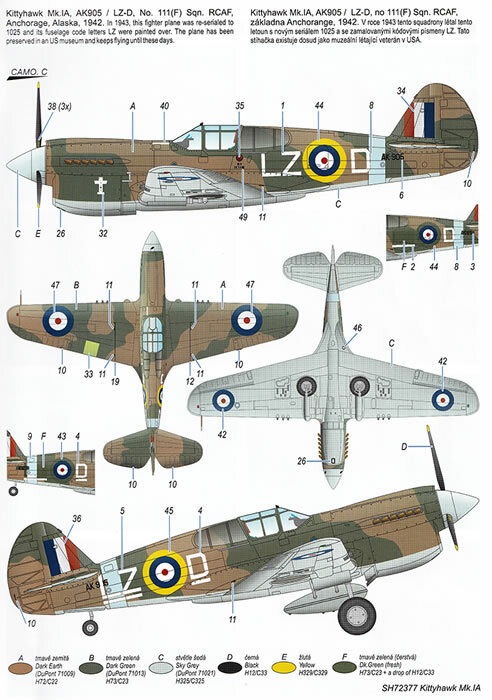 But the Kittyhawk flew not only with the RAF, it saw service also with other air forces of the Commonwealth, the RCAF put theirs against the Japanese forces over the Aleutian Islands while the RAAF used their Kittyhawks in the Pacific, and yes, we must not forget that the Aussies also gallantly fought in their P-40s over the desert sands of Africa. This series of Kittyhawk reissues and new releases from Special Hobby have certainly lifted to degree of accuracy and detail offered in gentlemen scale. 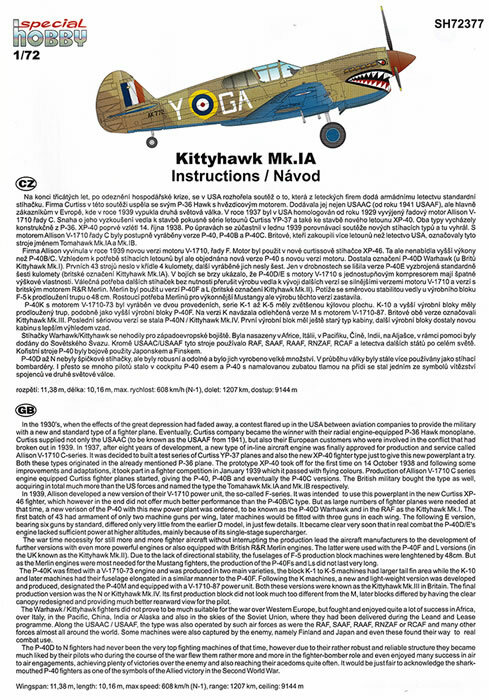 I am looking today at the first of the series, being the reissued Kittyhawk Mk.1A,with new extra parts the first of the new Allison F powered models. 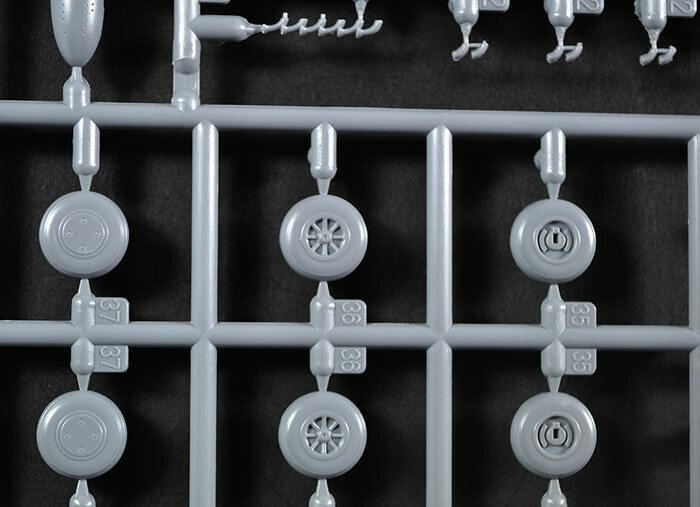 The model comes in a top opening sturdy box containing only 3 sprues. Two of these contain grey injected mould parts whilst the other is a smaller clear sprue. A colour instruction booklet guides the build through eleven steps with a separate coloured painting and decaling guide with colour call outs from the Gunze range, both Aqueous and Mr. Color. 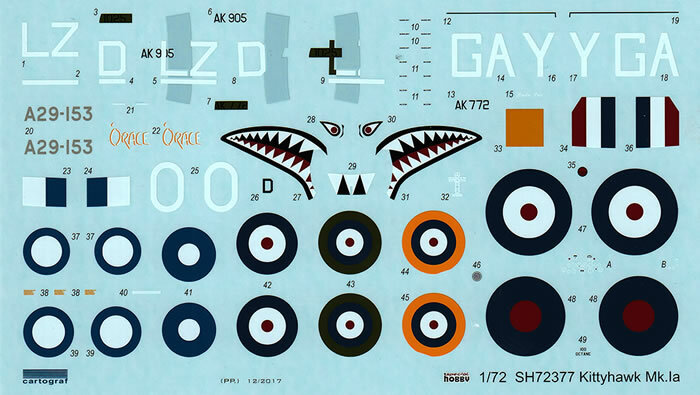 A very nice decal sheet, about A6 in size, completes the kit. 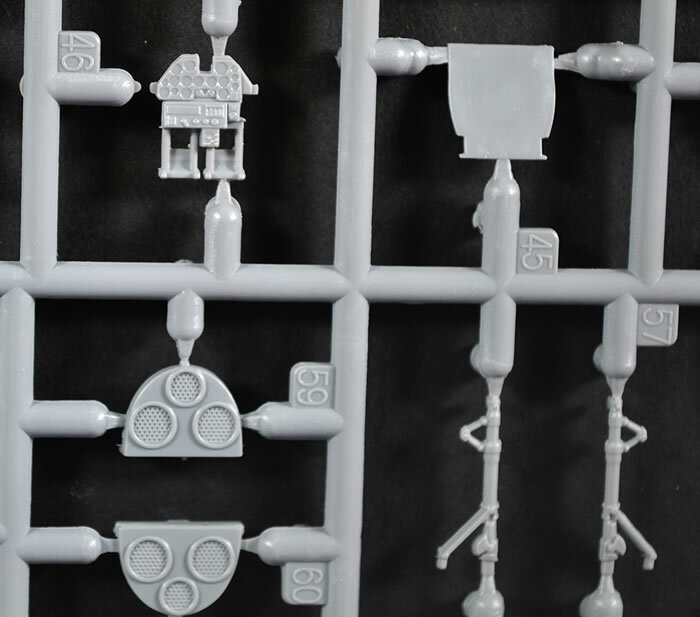 This sprue has the major parts of the kit on it, with only a count of 8 parts. Here we have the fuselage halves in one piece each, a full lower wing, 2 upper wings, tail planes, rudder and the front section of the prominent radiator intake. The panel lines are recessed with restrained depth but lovely detail. The only riveting on these parts is the rivets around the fillet panel for the wing/fuselage join, which is very appropriate. Please remember that Special Hobby kits are limited run kits and have no positive location tabs or pins, so be prepared to test fit with care before committing to glue. 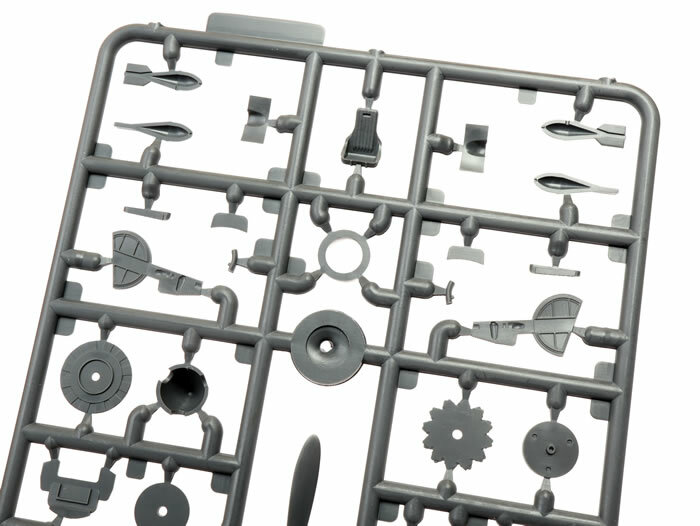 That said, it’s nice to see Special Hobby have actually downsized the sprue gates for the parts to a much more manageable size compared with their earlier kits. 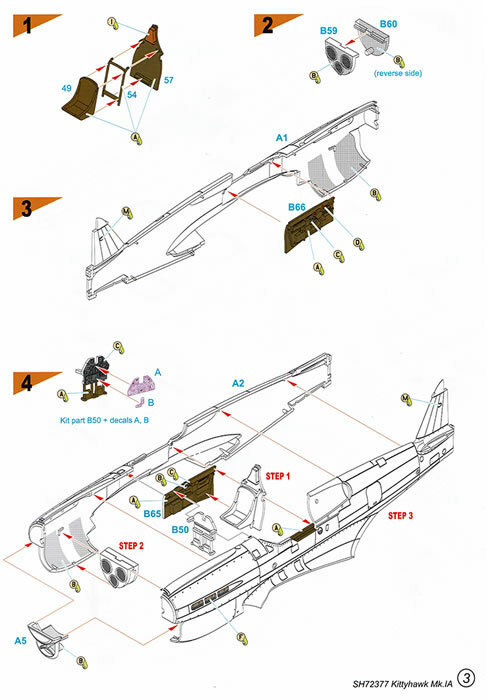 Sprue B gives us 65 parts, but of these 12 are not to be used as they are for other Kittyhawk aircraft in the series. 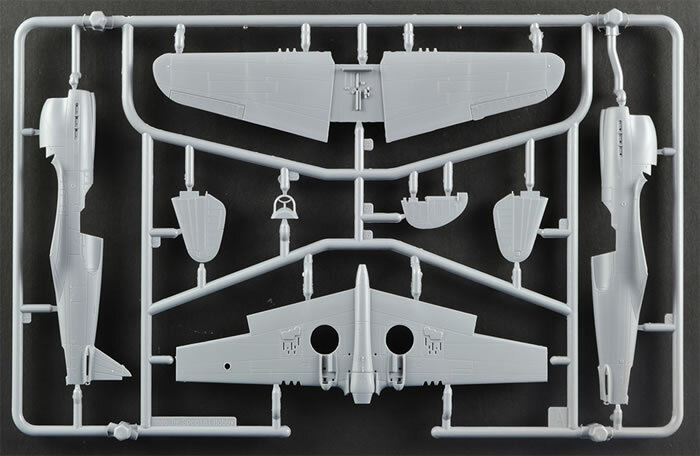 This sprue, which offers the smaller parts has two styles of the propeller, one with narrow chord blades for the early P-40s, the other with broad blades for later versions of the plane. For this kit it’s the narrow blade. 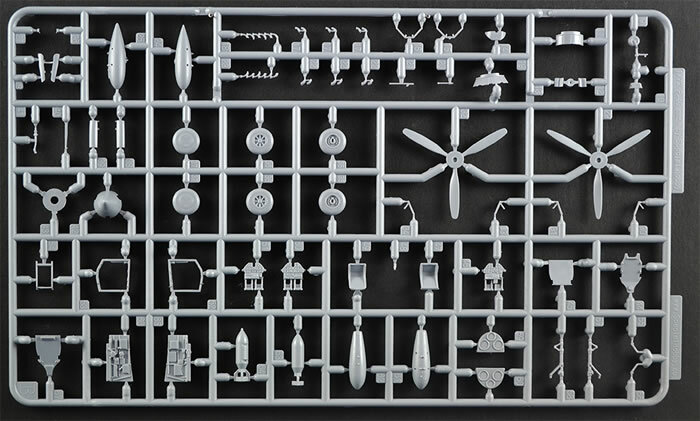 Sprue B has the remaining parts of the aircraft on it and amongst these smaller parts you can find also several other alternative parts such as for example two various exhaust stacks or two styles of the underbelly fuel tanks as well as a range of instrument panels for 3 different versions. The spares box will be happy for these extra parts. 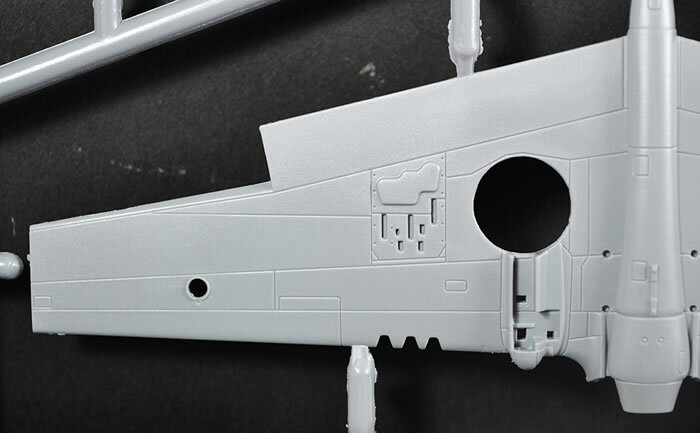 Being aware of the limited run nature of the kit, I forgot above to mention that there is literally no flash and virtually no mould lines on the parts. A big pat on the back for the Special Hobby team. 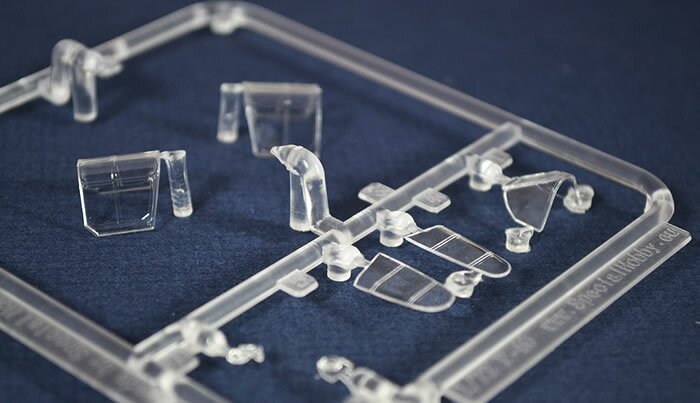 This is the clear injected moulded sprue with 7 parts, all to be used on it. When I opened my box, I was disappointed to find that the 2 largest canopy parts had come off the sprue and were floating about in their bag. Luckily they were not damaged but could have been broken easily. The actual canopies are clear and were blemish free. You are supplied with 2 of the main canopy sections, one for a closed canopy and one for an open canopy. These are of a subtle difference that enables their positioning of the fuselage. 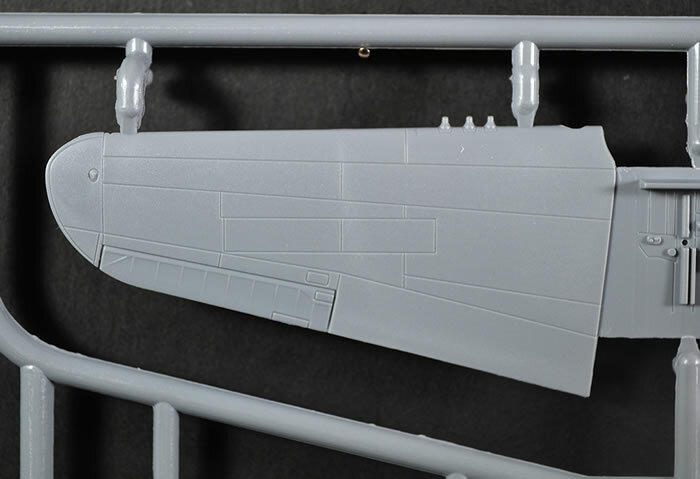 You also have a canopy front, 2 rear windows for the fuselage, underwing landing light and a gun sight. The instruction booklet is a glossy presentation with colour used throughout the build sequence to help. 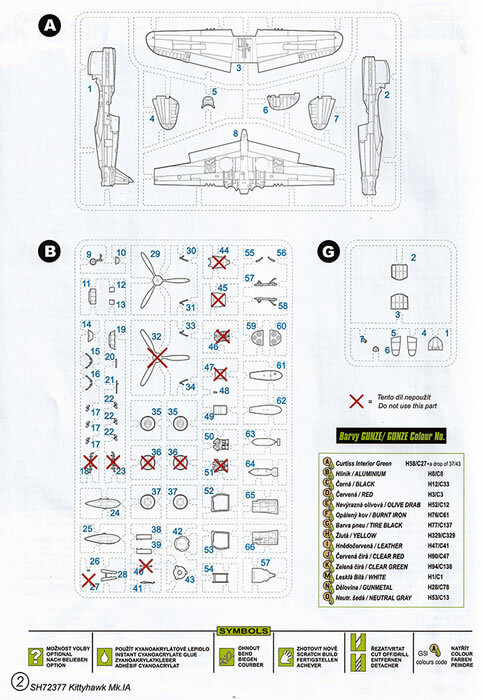 I have many Special Hobby kits and these are the best instructions I have seen from them. The A6 sized decal sheets is crisply printed by Cartograf and is in perfect register. In conclusion, this kit adds a refined kit able to produce a detailed and accurate version of the early Kittyhawk. This kit certainly looks as if it will build into an excellent model with a little TLC by the average modeller. A must for those interested in this version of the Kittyhawk in service of the Commonwealth forces in WWII.